These Pull Tab Boxes come in three fluorescent colors and clear. They all feature a cash drawer that fits underneath. 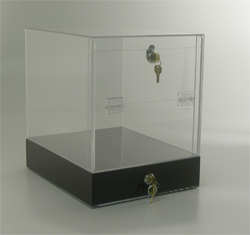 Our Pull Tab Boxes are made of a durable acrylic/plastic for long use and are great for your next fundraiser or event. Complete with lock and door on the back for added security, these Pull Tab Boxes hold up to 4,000 tickets. All Pull Tab Boxes are in stock for fast shipment.